“The work we do is expensive, and we want to do more of it,” Sifton writes as justification. The Times probably has to pay for recipe developers, photographers, web people, techy app people, video makers, assistants, maybe recipe testers and social media people too. You know, kind of like what food bloggers do as one-person shops? The question is whether consumers will pay for what’s already free. A major competitor got in a few licks about whether anyone would do so. “Not to mention, it takes only a little Google-fu to find recipes that are ‘adapted from’ or ‘inspired by’ whatever recipe you’re looking to find,” snarked Karen Lo on Food52, which crowdsources free recipes from amateurs through contests. They, along with Epicurious, Serious Eats, FoodNetwork, TheKitchen, Leites Culinaria, and Allrecipes put out a ton of free recipes online and make money by other means, mostly from advertising or selling products. What Lo also implied is that the NY Times recipes are not original, anyway. Like anyone cares. Of course, neither are most of Food52’s. Don’t get me started on what is original and what is not, and how many recipes are adapted. An NPR Marketplace reporter called me to ask who else gets people to pay for recipes. I could only think of subscription services begun by entrepreneurs such as Six O’Clock Scramble and Nourished Kitchen. And remember when cookbook author Marcy Goldman tried selling recipes for $2.49 each in 2011? That didn’t work too well, but the subscription services I mentioned bring in six figures annually. The NY Times’ $60 per year boils down to the price of two new cookbooks. Of NYT Cooking’s 10 million readers, only 840,000 are Times subscribers. That leaves 9 million+ readers to solicit. Even if only 10 percent subscribe, that would bring in a nice piece of change, around $54 million. You have to understand that Google and Facebook take an astonishing 65 percent of online advertising income. Newspapers are looking to consumers to make up some of the lost income. What do you think? 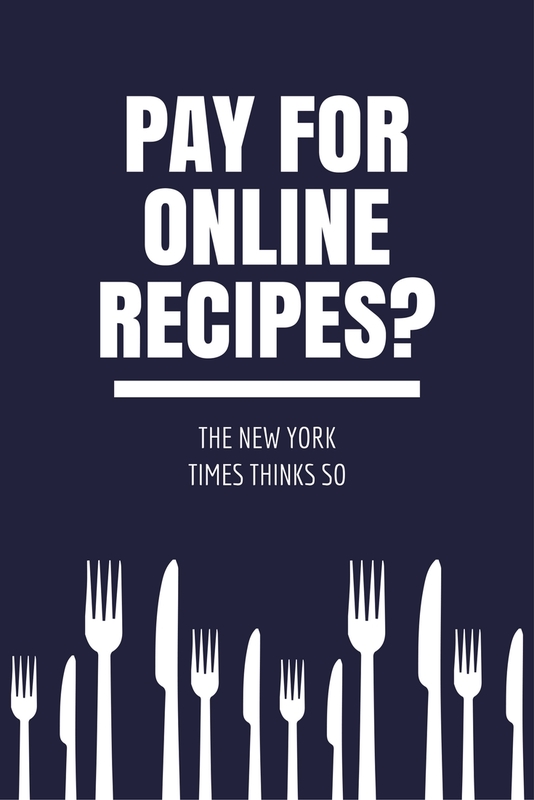 Will consumers pay for NY Times recipes? Are NY Times recipes so superior that they are worth the money? Or will people subscribe for some other reason? Nope. I can get cookbooks at the library. I can get recipes online free from the few bloggers I trust. I pay for Cooks Illustrated and now, Milk Street, but only because I am interested in the science of why cooking works the way it does. That is, Cooks Illustrated (as annoying as Christopher Kimball is) offers me something I cannot get for free – analysis and techniques I can use elsewhere and recipes that never, ever fail. Interesting that you pay for magazines but not cookbooks. I wonder if you could get Cooks Illustrated and Milk Street at your library — and then you wouldn’t have to pay for those either! I have made some Cooks Illustrated recipes that either annoyed me or I thought were “meh,” but I do like to look things up in their big book when I need info on technique. I used to use Cooks as my “go to” and sometimes I can catch the Cooks Illustrated Test Kitchen on cable TV. (I am not impressed with Milk Street seems like everything about it cost money.) However, I love Serious Eats and always trust what Kenj has to say! I am sad that NY Times will be charging for access to recipes. It was the one thing I could get for free without having to subscribe to the newspaper. I always looked forward to the Wednesday food issue with Melissa Clark and David Tanis. I will not be participating in the subscription. It sounds so sad. Let the grieving begin! You can always buy cookbooks from the authors you like, and from the NY Times, for that matter. Very funny and…oh so true. Christopher Kimball is oh-sso-annoying. I find I remember his recipes longer than I do others I read, though. Annoyance must be a mind-tickler. Despite those feelings, I enjoy the edification. Bless you, Christopher; seems you can’t help it. And the NYT? Also educational, but I wouldn’t care to pay for this column only. I have dozens of cookbooks and references I can use instead. Probably won’t subscribe. I’ll see what they provide for free. I love their emails though. I often get inspiration from the email and from what I’ve read, the email recipes will be publicly available. I also signed up for Milk Street at a reduced 1st year rate and enjoy the variety and science. We’ll see if I subscribe beyond the first year. I get the email newsletter either and I never see recipes as part of it. They are always links. But I thought the links will be blocked unless you have a subscription. You are the second person to mention Milk Street, but it’s common to pay for magazines. Maybe you’re talking about an online component for which you are charged separately? Hmmm. I am already a subscriber to the NYT so it has not been an issue. I do look at their recipes a lot when I am in need of inspiration. Newspapers are struggling, and I think the food section/recipes are a big draw at NYT, which they have curated very well. The recipes are usually well written by very good/experienced food writers, so to me it would be worth $5/month. I think the point that the content costs them a lot to produce is a valid one. I write for another paper which has recently cut down the food section pages and the number of recipes in the section (which has also impacted me.) It would be a shame to see newspaper food sections disappear, and if this is a way to keep it alive at the Times, I am all for it. BTW, Christopher Kimball has NEVER given away free content, and I agree with Dianne on the quality. Milk Street is trying to go in a slightly different direction (more ethnic stories and recipes, but much the same as ATK in many ways.) I don’t subscribe to either one. This sounds like a sensible argument, Sally,except that there is so much resistance to paying. That is sad that the paper you write for has cut the food section. Another writer told me the same thing, that her paper is now twice weekly instead of weekly, so half as much work. It hasn’t been a good decade for newspapers. It’s kind of funny to me that Milk Street is more “ethnic.” Kimball doesn’t seem to be the type of guy to go in that direction. Dianne, I agree. The resistance to paying, especially after free access, is enormous. But that’s the problem! With a few exceptions, much of what is “free” online is not of the same quality of what has been published in a book, magazine or on a well-run website (mostly). Maybe people just don’t care that much, or don’t discern enough difference to warrant parting with a few extra pennies. I don’t think they (general public) have any idea what goes into recipe development or photos. The internet has been a boon for new voices to be heard and all that is good, but so much free content really hurts the professional food writer who is trying to make a living! We’ll have to hope that the average NY Times reader who cooks understands that their recipes are high quality, Sally. Even as someone who doesn’t follow recipes too much and looks for ideas, I do like a well-written one that works. I wonder if the Washington Post is looking at their model with interest. p.s. Interesting about Kimball. I wonder who’s financing it all. I pay for cookbooks, especially from people I know and respect. I would not pay for online recipes from NYT or any one else. But then again, I’m not that target audience. I agree that if even 10% of NYT’s pool of people pay, it’s a good chunk of money. But I’ve never seen a recipe from NYT that was original or worth my dime to buy it. Subscription service models work for those who have a massive following because only a small percentage will pay. The rest of us have to hussle and earn our money in other creative ways. Indeed, Laura. The rest of us are hustlers. But now Sam Sifton has to hustle too. Newspapers never had to put so much copy online before, and editors didn’t have to do social media. And now he has this newsletter to write every day. It’s a different world, one where a behind-the-scenes editor has to become an internet celebrity as part of his job. I’m excited to see outlets move in this direction. It does cost a lot of money to test, photograph, and publish quality food content. From an outlet as big as the NY Times, that sends a strong message. Hopefully a step towards changing the entitled attitudes folks have towards online content. I blog less these days and put more of my efforts into selling recipe ebooks to my following, which pays better than relying on advertisements and sponsored blog posts. Would much rather do that than publish all of my ideas for free *and* allow that content to be easily stolen. It doesn’t bother me that people who were never willing to pay will turn to free sites, but I don’t personally believe anybody is “owed” free recipes just because they have internet access. That’s a good point. We are not “owed” free content. We’re just used to it. And it is kind of a weird model where professionals are paid to produce good-quality free content. The idea used to be that the advertising will make up for the expense, but clearly, it doesn’t anymore. It’s interesting to me that you blog less now because there’s less money in it. Some people blog less but do social media more, and send people to links on their blogs to get the ad revenue. Great topic, Dianne. I don’t understand why high-quality digital content has been free this long. Whether a small blog just starting out or the NYT, it’s time for people to get paid for their hard work in food. Period. Thanks Elizabeth. They are getting paid as employees and contractors of the NY Times, so maybe it’s hard to imagine why we should have to pay them as well. We have to get used to these strange new models, and to the NY Times disrupting the system of free free free. I actually got the chance to go to a workshop with two of the NY Times food stylists (bloggers, too) a couple of weeks ago. They do indeed invest a lot in each recipe. That said, it sounds like they might not be seeing the returns they need. I’m curious whether or not consumers will pay. To be honest, I think it’s difficult for most that revenues must come from brands. Recipes used to be purchased by consumers, back in the days when only print was available. But the free flow of information caused such a huge shift in revenue sources, and honestly, I don’t think it’s for the better. Now most recipes are influenced heavily by brands, fleeting trends, and whether something will photograph well for Pinterest. Actual consumer needs and recipe quality seem to take a back seat. I would love for the new NY Times model to work, but I’m also not sure that we can take a step back in time that way. I will pay for cookbooks and some magazines — I will NOT pay for a NYT subscription. I can get lots of good recipes from my favorite bloggers and cookbooks. I do buy cookbooks. I read them like novels enjoying some of the stories behind the recipes. I usually pay for cookbooks. I did subscribe to magazines in the past but somehow when I wanted to cook I always ended up turning to my cookbooks more than the magazines. So now I rather invest in a good cookbook that anything else. I love cookbooks that are partly memoirs or teach me about other countries culinary traditions. Since I came to live in Iran, I have been trying to learn more about the cuisine through cookbooks and visiting local markets. So basically I would not invest in anything else. The question is,is the content worth $5/month. It’s cheaper than some magazines and for me the true selling point is the depth of recipes. Craig Claiborne, Bryan Miller,Florence Fabricat are at my fingertips. It’s a valuable resource. I always hoped Gourmet would have done something like that. Oh okay, it sounds like you’re game to pay. Most food magazines don’t cost $60 per year except, even Cherry Bombe, which is $38. I agree that the recipes are of much higher quality than the norm, even in some food magazines. Thanks for this discussion. I think 60$ per year is a lot of money, 5 years will cost 300$. I can buy many good cookbooks with that amount. I would have bought a one time access if they would have offered that. On ATM subject I find that they often take the long road with added steps for recipes (can be a deterrent for average cook) but still I am a subscriber as I learn tricks wilemwatching. I also trust their evaluation on kitchen tools. If this works for them then great. Many bloggers receive advertising on their blogs, and while this doesn’t cost the viewer anything, they are paying indirectly as there is an infusion of ads on their screen. I wouldn’t pour all of the work I do on my blog for free. There are too many expenses around it, and your time is worth something. With that being said, I think consumers have an appetite for only so many subscriptions. There is some content I would pay for, good quality content is not free to produce. In our profession food writing is known as something you do for fun. The NY Times definitely doesn’t do it just for fun! Maybe we could learn from them. But in the meantime, most bloggers do so as a hobby. I wonder how that affects the idea that recipes should be free. They didn’t used to be free, unless your neighbor or your mom gave you one, or you got a cookbook out of the library. I would put the NY Times in the good content category, so it sounds like you might be willing to pay. Meanwhile Stephanie, yes — your time is worth something! We are now obliged to pay for online newspaper subscriptions anyway so what’s a little bit more? I do think that the food section should be included in the online subscription, but if someone is willing to pay a bit more for extra recipes and videos from a source they trust, why not? As you say, if it works, it works, if it doesn’t it doesn’t. People still pay money for cookbooks and magazine subscriptions when recipes are free online, right? Would I do it? No. But heck, they might as well try. I just hope that folks who pay that extra money get their money’s worth. Yes good point. Recipes will continue to be free online, and some people will pay to get them from the NY Times. The question is how many, and whether it’s worth the effort the staff and freelancers put into developing a quality product. I applaud that sites like the NYT and other outlets — both big and small — are valuing their recipes by putting a price on it. We all know how much time goes into creating and promoting these recipes. We really need to learn how to be profitable business people first — that is if we are indeed serious about our work in food. Otherwise we will have to get jobs doing other things that we don’t love as much — which is not an option for me. It is nice, isn’t it? A confirmation that our work is worth something. I wonder how that affects all the people who give away their food writing? Probably not at all. I just had a conversation with a client who had been writing a food column for free for her local paper for 6 years. I convinced her to ask for pay. The publisher said it was free publicity and that many people wanted her job. In other words — he doesn’t value her work enough to pay for it. The interesting thing is that he pays the man who takes photos for her article — a very small amount, but something. Interesting topic, especially these days when net neutrality is under attack. I’m a current subscriber to the NY Times but exclusively read the digital edition. I’m in favor of any legitimate source of revenue that will keep sources of original, fact-checked journalism available to us. I regularly source free recipes online on whichever site seems reasonable to me at the time, and frequently source instructions and cooking techniques on YouTube where ads must be tolerated to get to the material. I contribute money to Wikipedia and also several newsletters whose content I appreciate. It’s possible that there is a general lack of public appreciation for the costs involved offering material online, and I think it’s fair to charge for curated material with special features. Perhaps if the NY Times can develop their online recipes / food section into a reliable revenue stream, they will commit more creative resources to improve their whole food related presence. We don’t know their longterm strategic planning but I admire their organization and wish them luck. This sounds quite sensible and business-like, Christie. I like that you are willing to give money when you appreciate the work. I wonder if they should have charged from the start. Now they have to justify their position, which they really shouldn’t. I’m sure there’s a big budget for all the work they do. If they hire top chefs and curators that people actually look up to, I think they will get a good consumer base. Otherwise, it’s much easier to just go to Google and find whatever you need. People do look up to their recipe writers and developers. They are considered some of the best. It is a high honor to write for the NY Times. The library is awesome. I have a Kindle and a PC Kindle app. and can download almost any book or magazine that I want for 2 weeks. No late fees either, you just can’t access the books after the check-out period. I thought the NY Times only had recipes, Carol. You’re talking about the public library?